Recommendations for the Presentation of Infrared Absorption Spectra in Data Collections–A. 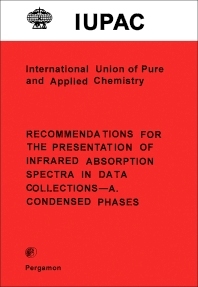 Condensed Phases presents the recommendations related to the infrared spectra of condensed phase materials that are proposed for permanent retention in data collections. These recommendations are based on two reports published by the Coblentz Society. This book emphasizes the three levels of quality evaluation for infrared spectra as designated by the Coblentz Society, including critically defined physical data, research quality analytical spectra, and approved analytical spectra. This text discusses the criteria for spectrophotometer operation, including resolution, wavenumber accuracy, noise level, energy, and other performance criteria. This book is a valuable resource for applied chemists.